Did you know that an online book merchant is funding more than 42 millions of dollars! Well, are you surprised? You may be brain storming right now. Who is He? Why would he fund such a project?? Jeff Bezos, the co-founder of amazon.com which is the biggest online merchant till date has a passion for funding projects. Jeff Bezos is one of the most influential persons who has a lot of recognition to his credit. He was ranked the second best CEO in the world by Harvard Business Review, after Steve Jobs of Apple. He always thinks in terms of long run. He believe that this helps in coming up with the interests what the customers expect. This long term thinking has helped amazon launch major success like kindle e- reader and its AWS cloud service. This Attitude of his is responsible for funding such a huge amount on this project. The project clock is a symbol for long term thinking that specifies that we humans have to start thinking in longer term. This project is actually a brain child of a computer scientist, designer and inventor Danny Hillis. It has a vision to provide an accurate time for about 10000 years. It is built with the cooperation of “Long Now” foundation. “The Clock,” is one of its philanthropic ventures. This clock runs more than 10000 years and ticks once for every year, century and cuckoo comes out in every millennium (1000 years). The fascinating part is that, it is built inside a mountain. It is an architectural splendour and quite an adventurous experience to be there. It’s almost 200 feet tall, located under a remote mountain near Texas. The entrance tunnel is situated 1500 feet above the desert. A door rimmed in stainless steel and another door is placed behind it. This is to keep the wild animals at bay. Now, the most deadly part, is the tunnel of darkness which is a hundred feet long. At the end there will be light on the floor which indicates the end of the tunnel. There is a spiral staircase winding up to the outer rim of the tunnel, raising towards the light. The amazing thing to notice here, is that the stair case is rimmed in a very effective way. The rocks sliced for this are very precise. The scientists invented a robot which grinds out the stairs at the rate of a few stairs per day. There is a huge stack of stone disks and a winding station where you find the sailing vessel that winds up an anchor. There is a mechanism to go further from this point. The anchor should be pushed first, then there is an entry to the portion of the tunnel. The need for pushing the anchor is to get the correct time from the clock and to calculate the melodies. The first part, the internal gears of the clock are found at this location. To reach this place it takes almost a day hike on the mountain. 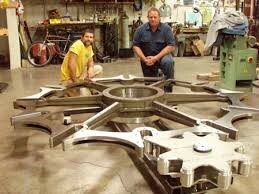 There are almost 20 gears, 8 feet in diameter, and each weighing 1000 pounds. These gears are embedded, with the never repeating melodies (3.5 million almost) that are heard when the clock chimes. This idea is to give each visitor a unique experience. These melodies are calculated by the strength we apply to wind up the anchor in the last stage. The electricity is not used to calculate the time instead it’s the physical strength with which the anchor is pushed. Finally, the face of clock can be seen a few steps ahead to the gears. There is an 8 feet long disk that displays the natural cycles of astronomical time, the pace of stars and planets and galactic time of the earth’s procession, time of the day. But, there is a need to ask time, the clock cannot show automatically. It shows the time of the last visit of human. This kind of working is embedded into the clock to save energy, the clock will not move its dials unless they are turned. This is achieved by power generated when you push the anchor. The pendulum is 6 feet long made of titanium, swings for every 10 seconds. This is the end of the adventure. Its energy to run is captured by the climatic changes occurring at that place and from the thermal power from the sun. Outside the mountain the thermal- difference device and the solar synchronizer that powers the clock are build. These are the only visible parts of the clock that can be viewed from the foot of the mountain, on the Texas land. The swings and other metals are free form corrosion as, they are made from the non-metals like stone and hi tech ceramics. These ceramics can be harder than the diamond. This construction, also involves many technical aspects. It is built by analysing many kinds of situations. Some of them is, making use of ceramics than the metals can protect the clock from erosion. Developing algorithms for the chimes in such a way that they are not repeated. This is GAINT because, its vision is to keep the time for the next 10,000 years. The main reason to build such a huge clock is to mould it as an artefact (An inaccurate observation, effect, or result, especially one resulting from the technology used in scientific investigation) that is capable of connecting our generation with the generations to come. This giant monument is the icon for long term thinking. This will enhance the need of long term thinking. The changes taking place right now will change the way the world works in the future. And the clock symbolizes it. Long term thinking paves the way to gain short term goals. It would be very charismatic to visit and interesting to think about. The long now foundation is also planning to leave a part of its construction to the future generation to make them understand its importance.